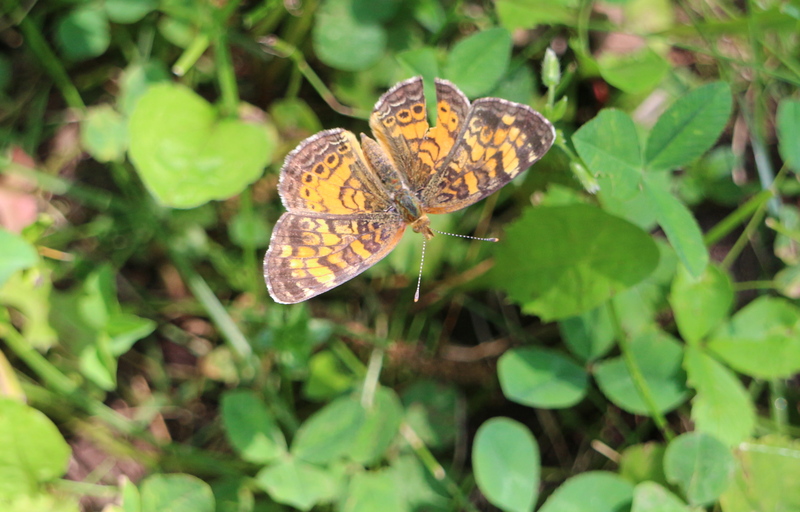 Sun glows on the wings of a crescent butterfly (Phyciodes). I spotted a small orange-and-black butterfly in a patch of white clover at our cabin in Pine County, MN. Most butterflies rarely sit for more than a few seconds; this one was an avid sunbather, fully opening its dark-spotted wings and resting on a clover bloom for several minutes. Its wing pattern indicated it was a type of crescent butterfly. Because of their similar appearance and habitat, crescents challenge us to identify them correctly, and this could have been either a pearl or northern crescent. Adults of both species nectar on white clover, asters, thistles and dogbane. Their brown, spiky caterpillars feed primarily on the leaves of asters, and they overwinter to become next spring’s first generation to take flight. Look closely at the photos and you’ll see the crescent’s worn, tattered wing — evidence that it’s no newbie, has seen some extended flight time, has already lived a good portion of its life. And still, though it shows some wear and tear, it remains beautiful even as it ages and lives out its brief days. Tattered butterfly wings may indicate a close call with a predator or advancing age. I think of the recent death of my mother-in-law, Mary, and of my friend, Cathy, last January. I watched them complete their lives, I held their hands, hoped they could hear my prayers and words of comfort. I wonder about them often, and deeply hope that, as the simple brown caterpillar morphed into a creature of light and air, they too have transformed into something lovely and eternal. 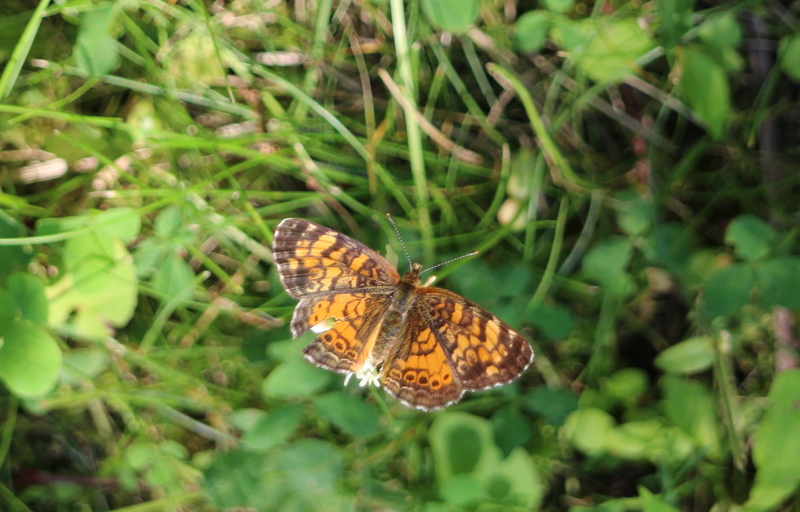 This entry was posted in Butterflies, Nature Photography, Pine County, Summer, Woodland Nature and tagged Crescent butterfly, Life, Metamorphosis, Phyciodes. Bookmark the permalink. I so love your writings!! Thank you! This is just lovely, Beth.